President Muhammed Buhari and his Public Relations handlers. Note: This story was first published on January 22, 2017, in response to news reports about President Muhammad Buhari's health concerns. At that time, Buhari's public relations handlers' argued against the development in the news and that Buhari will return to Nigeria on February 6 after his medical vacation abroad. But rather than return to Nigeria on February 6, the information Nigerians got was a request by Buhari to the country's National Assembly for an indefinite extension of his medical vacation. This raises a question about who may have been telling lies or covering up the truth about Buhari's health situation. There is a debate among Nigerians over whether President Muhammad Buhari is ill or well. News reports by The Sun newspapers said on Sunday that the President Muhammad is well and alive. ​ The discussion about Muhammad's health concerns began on Friday, following Buhari's departure from Nigeria on Thursday, and Vice President Yemi Osibajo's rushed home journey on Friday from Switzerland, to assume presidential powers, in the president's absence. The sudden news of the president's seeming impromptu travel on Thursday and the vice president's abandonment of the economic forum in Davos, where he has led the Nigerian delegation, have raised eyebrows and concerns about the president's health. Is President Buhari ill or well? People are saying it is doubtful he is well, but they are unsure of the state of the president's health. If he is unwell, how serious? They ask and hope that it is not so serious. People obviously are agitated. They have reasons to be worried. First, President Buhari is not a young man, who is unexpected to have age old related illnesses. He is well into his 74th years. Secondly, it is not the first time that Nigerians are having issues and concerns about a government, that is not open enough about their president's health. There was Umaru Musa Yar' Dua, who had serious health issues before he assumed powers, but which seriousness of his state of health was covered up until the announcement of his death. He traveled in and out of the country so often enough for Nigerians to suspect that something was wrong, and yet the government said everything was well! These are the memories that may have hit many Nigerians at the weekend as they read in newspapers about how President Muhammad left the country in a hurry on Thursday, on a medical trip, while the vice president was also away in Davos. The seat of power was left vacant for some good hours, before the vice president's later arrival from Davos to assume presidential powers. This development raise a serious question about the type of arrangement the government had for the president's travel and whether the government was aware that the president would be traveling or not aware before the vice president's departure to Davos? And if the government was aware that the president would be going on a medical trip, why did the government allowed the vice president to lead the country's delegation to Davos, when he should have stayed behind to take charge of government in the absence of the president, while another senior official should have led the delegation to Davos? If the president's trip is a medical trip and he is so impromptu to leave the seat of power without a delegation of authority to a lesser officer, observers feel that something must have been amiss with the president's health, which the government has not disclosed. 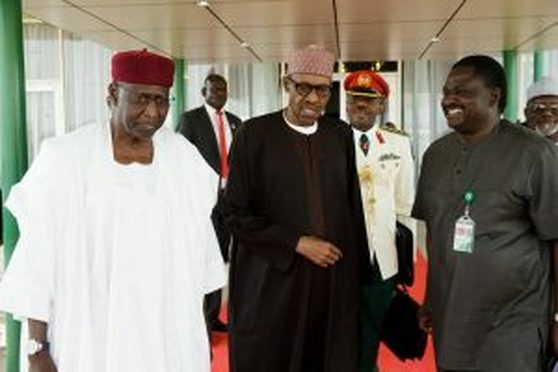 Sure, President Buhari is on a medical trip, alive and well, as newspaper reports indicate on Sunday, quoting statements of the president's communication handlers, in effort to allay fears about the president's health. But the photograph used in one the news reports - taken in Nigeria - and not while the president is in Germany on his feet, is not enough to convince anyone about the intent of the president's communication handlers that the president is well, hale and hearty. It is also not a rumor, what they have called a rumor about the president's health. No Nigerian is wishing the president's death Obviously, discussions about the president's health follows development in the news, concerning the mishandling of the president and vice president's travel arrangement.